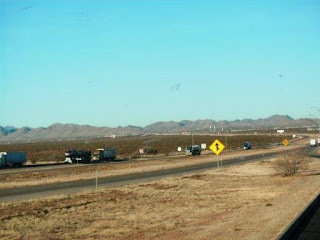 January 17, 2012—Last August when we drove to Arizona, we took I10 all the way. This time, we detoured up to McKinney, Texas (north of Dallas). Our Garmina (GPS) routed us down to I20, which transcets northern West Texas, until it connects with I10 in the south. 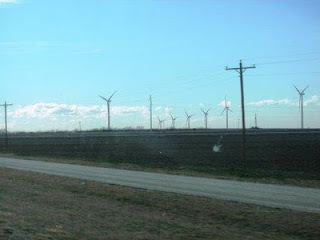 This was the first time I had been through that part of Texas. What we saw was a bit different from what we had seen last summer. Although we did not pass directly through Texas Hill Country, the last was hilly and provided vast vistas. It became arid, but in a Texas desert way, which is different from the desert in Arizona and California. The farther west we drove, it became apparent that oil still reigns as king in that part of the country. Oilrigs, looking like the dinosaurs pumping thick, black energy from deep within the ground, were everywhere. We also passed several oil refineries. With the abundance of oil and gas in the Texas countryside, you would think diesel and gasoline would be cheaper than in other places in the country. Not necessarily so. We did find some bargain prices around Sulpher Springs as well as in McKinney, but in oil country itself? Not so. 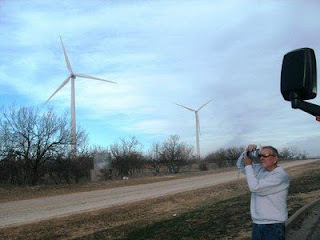 West Texas also had a lot of windmills. We saw a number of them last summer, especially in New Mexico. 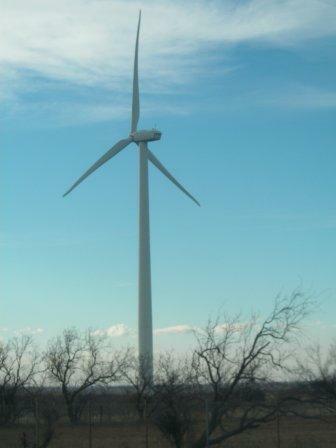 But windmill farms, each with more than 100 rotating mills, seemed prevalent all the way down I20. One farm had a windmill close to a rest area, and we got “up close and personal” to it. Last night we stayed, as planned, in a Texas rest stop. This time we got there before the trucks did, and we had a prime location. I went to bed early and slept well. This morning, we headed out fairly early (9 a.m.), and crossed over into Mountain Time about 90 minutes later. We have driven through New Mexico and are now in Arizona, climbing ever so subtly higher through the arid mountains. In the distance, though, we saw one mountain that had was topped with snow and surrounded by clouds. Nice sight! No “adventures” so far (let’s keep it that way). The cats seem to be getting used to traveling. Charlie even came out of his hidey hole a little while ago—in broad daylight, no less.